Desura has launched a new Alpha Funding initiative very similar to other crowdfunding projects like Kickstarter and 8 bit Funding. 5 Indie games have been selected as launch titles and out of which 3 will have Linux versions in future. The idea behind alphafunding is simple, fans get instant access to their favorite games with the understanding that the game might be buggy and isn't complete - but frequent updates will add polish over time. The developers can then fund the games continued creation, giving supporters early access to the latest and greatest content. Digital distribution is an amazing medium for getting access to content early, so while alphafunding isn't for every game, why wait till release to fund your game, when you have fans wanting to support you every step of the way? It is a model which has worked extremely well for Minecraft, Overgrowth, Natural Selection 2 and others, who have benefited from their fans support from the very beginning. 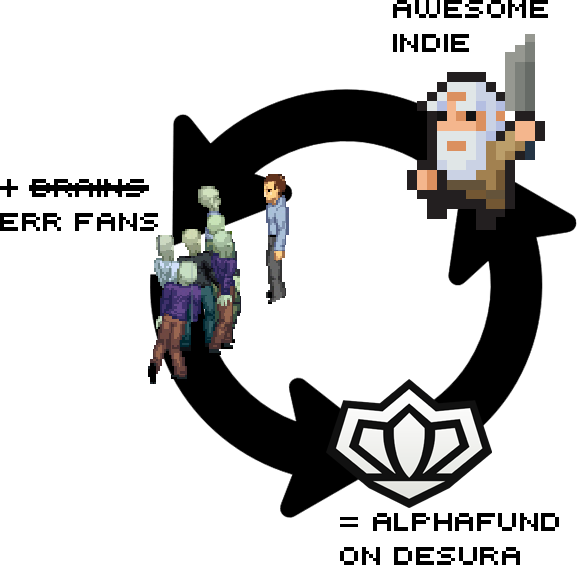 The Five launch titles are - Project Zomboid, Survivors of Ragnarok , King Arthur's Gold, Wyv and Keep and Rotion. Out of these five, three games - Project Zomboid, Survivors of Ragnarok and King Arthur's Gold will have Linux versions and will be supported by Desura Linux client once it is out. Absolutely, infact I believe their Linux versions (except for maybe KAG) will be supported on Launch. All we have have to do is wait for Desura Linux client to be released which should be soon as the development is going on at a really fast pace.